The centenary of the Balfour Declaration, 2 November 1917, is being used to delegitimise the State of Israel. The Balfour declaration (this is now your land) legitimised nothing! The agreed signed sealed and witnessed, two state solution would have? Except,( thieves demonstrate more honour) it has subsequently been used for outhouse duties! As ever more illegal settlements were built on annexed land, never ever included in the Balfour declaration! Your spin is better than the now legendary whirling dervish. Israel is constantly on the back foot, irrespective of the changing political dynamics. Is the resurrection of the Balfour agreement as an issue, more of the same “ back foot” response? Israel is a religious state. The war against the Gentiles will continue; it is mandated by God. One rule for the Gentiles, another for the Hebrews. Read below! Return in a thousand years, nothing has change. In 1000 years there would be another D Singer with nonsense. "Lord Balfour (declared), chillingly, that Zionism was 'of far profounder import than the desire and prejudices of the 700,000 Arabs who now inhabit that ancient land"
" And Zionism, be it right or wrong, good or bad, is rooted in age-long traditions, in present needs, in future hopes, of far profounder import than the desires and prejudices of the 700,000 Arabs who now inhabit that ancient land". Why don't we start wil the actual letter David? You waffle on so much crap to bolster your bs stories. Why don't you just a link to the actual letter in question. "will use their best endeavours to facilitate the achievement of this object, it being clearly understood that nothing shall be done which may prejudice the civil and religious rights of existing non-Jewish communities in Palestine"
Emphasis: How exactly were you going to create a Jewish state (National homeland for the Jews) whilst not doing anything to prejudice non- Jewish communities? Isn't it really just a load of crap right from the start? 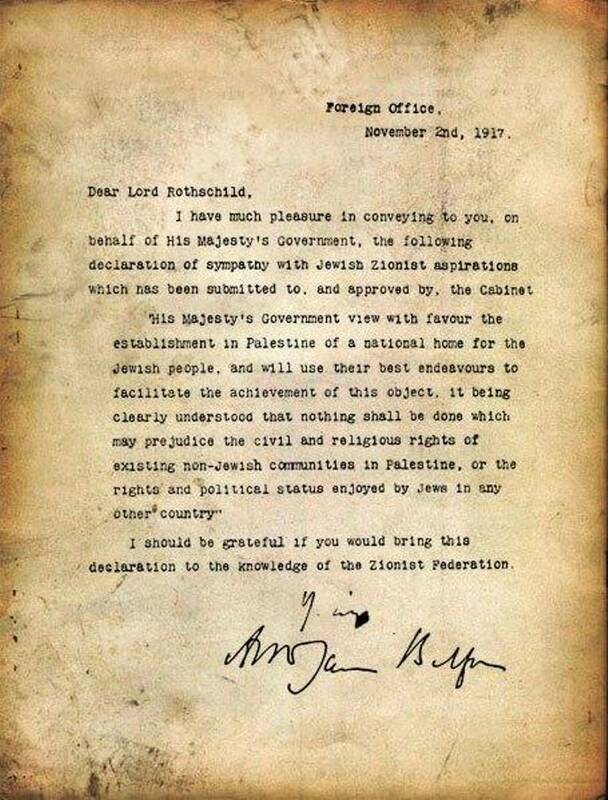 Lets take a better look at what happened regards the Balfour Declaration. And now lets remind ourselves of Naeim Gilardi's revelations. Now you can improve your writing and do non-biased articles David Singer. - No need to thank me, you're welcome. The Balfour declaration was a promise by the British government during World War One, announcing support for establishment of "a national home for the Jewish people" in Palestine. Palestine was still a part of the Ottoman Empire at the time, with a minority Jewish population. The British War Cabinet began to consider the future of Palestine during World War One in which it fought the powers of Germany, Austria-Hungary and the Ottoman Empire. According to historian Jonathan Schneer, the British somehow "felt that the Jews held the key to winning the war and so they had to figure out how to bribe the Jews to support them."